vandevere – The Bunch Blog! Kia dropped a second teaser photo for the new Soul, this time giving us a glimpse of the crossover’s new eyes up front. The lights are definitely smaller than before, and frankly, we can’t wait to see the revised front clip in its entirety. The two-week teaser campaign for new vehicle debuts at the 2018 Los Angeles Auto Show is underway, and Kia is keen to be part of the drama. 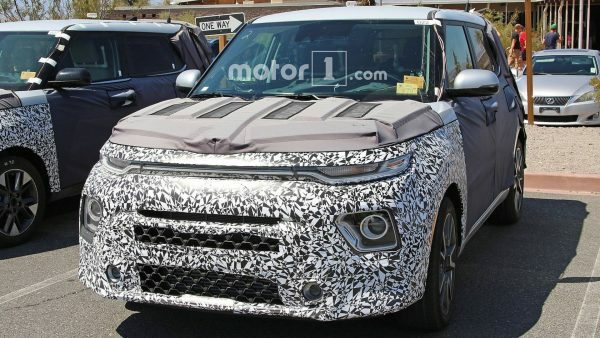 The automaker just dropped the morsel above for us to ponder, showing a small portion of the new Kia Soul’s backside. As far as teasers go it’s a pretty safe one, since the new Soul is still easily recognizable from such a close-up angle. The big news is that its underpinnings are all-new and shared with the Hyundai Kona, which means all-wheel drive should be an option – something Soul fans have wanted since the very beginning. It will also get an all-electric variant that should have a range of approximately 300 miles. It won’t be a performance beast like the offerings from Tesla, but the electric powertrain is expected to deliver around 200 horsepower (150 kilowatts) so it shouldn’t be boring, either. Gasoline-powered Souls should have a choice of either a 2.0-liter naturally aspirated four-pot, or a 1.6-liter turbo. Kia will reveal the new crossover in just a couple weeks at the LA Auto Show, and we expect to see the electric version there as well. We’ll have boots on the ground to bring you all the latest news and photos from the event. DETROIT — Today, Chevrolet announced that the 2019 Silverado LT will be larger, more capable, more fuel efficient and feature a starting at MSRP that is up to $700 less than the outgoing model. The 2019 Silverado LT crew cab has a starting at MSRP $700 less than today’s truck, even with new standard equipment including an all-new 2.7L Turbo engine with 22 percent more torque than the 4.3L V-6 it replaces, an eight-speed automatic transmission, stop-start technology and active aero shutters. The upscale and comprehensively equipped High Country also introduces a host of new standard equipment, including the 5.3L V-8 with new Dynamic Fuel Management, push-button start, stop-start technology, active aero shutters, Lane Change Alert, Side Blind Zone Alert, Advanced Trailering System, enhanced LED exterior lighting, dual exhaust outlets and class-exclusive power up/down tailgate — and a starting at MSRP increase of only $1,000. Off-road tuned Rancho™ twin-tube shocks. Two-speed transfer case and automatic locking rear differential. Skid plates for engine oil pan and transfer-case protection. 18-inch wheels with all-terrain tires. Dual exhaust outlets for models equipped with V-8 engines. Lane Change Alert with Side Blind Zone Alert*. Front and Rear Park Assist*. Forward Collision Alert* and Following Distance Indicator*. Low Speed Forward Automatic Braking*. Lane Keep Assist with Lane Departure Warning*. GM-exclusive, 3 x 7-inch configurable color head-up display. 8-inch configurable driver information center. The next-gen Silverado is also larger than the outgoing model in virtually every dimension. For example, the Silverado crew cab, short box has 1.2 inches more total width, 1.5 inches more total height, 1.7 inches more total length and 3.9 inches more wheelbase. As a result, the Silverado offers an additional 3 inches of cab length for all configurations, and up to 4 cubic feet more interior volume. It also offers the largest cargo volume of any full-size truck in short-bed, standard-bed and long-bed models. In fact, at 62.9 cubic feet, the Silverado short bed offers more cargo volume than the standard bed of the Ford F-150. Despite the larger footprint, the Silverado is up to 450 pounds lighter than the outgoing truck (crew cab, short-bed models with the 5.3L V-8 and Max Towing Package), due to advanced manufacturing and the use of mixed materials. Crew cab Silverado models increase in payload up to 14 percent, or 340 pounds. The 4.3L V-6 now offer a maximum of 8,000 pounds towing, up 400 pounds (regular cab, rear-wheel-drive models). The 5.3L V-8 with Max Towing Package now offers a maximum of 11,600 pounds towing, up 400 pounds (double-cab, rear-wheel-drive models). For 2019, the 6.2L V-8 is now exclusively offered with four-wheel drive. Equipped with the Max Towing Package, it now delivers a maximum of 12,200 pounds towing, up 500 pounds from a similarly equipped 2018 model (double-cab, four-wheel-drive models). The first engines to be produced will be the 5.3L V-8 equipped with an eight-speed automatic, and the 6.2L V-8 equipped with a 10-speed automatic. Both offer more than 5 percent improvement in city fuel economy, for an improvement of 1 mile per gallon based on EPA estimates. Models equipped with the 5.3L V-8 and rear-wheel drive offer an EPA-estimated 17 miles per gallon city, 23 highway and 19 combined. Models equipped with four-wheel drive and the 6.2L V-8 offer an EPA-estimated 16 miles per gallon city, 20 highway and 17 combined. EPA estimates for the other engines, including the all-new 2.7L Turbo and all-new Duramax 3.0L Turbo-Diesel, are not yet available. However, both engines are expected to offer customers even greater fuel efficiency choices. 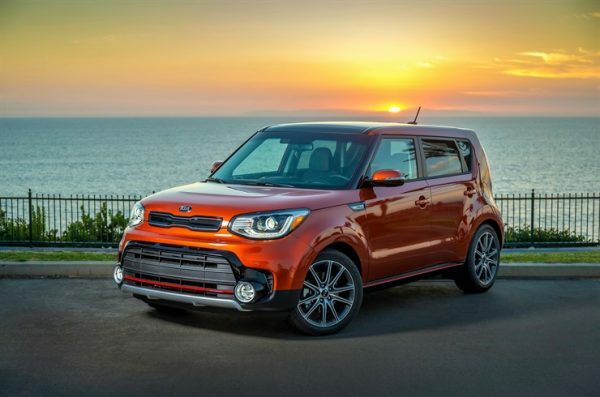 IRVINE, Calif., June 5, 2018 — For the second year in a row, the Kia Soul has been named among the 10 Best Family Cars of 2018 by Parents magazine and Edmunds. Experts and editors tested hundreds of new models and selected winners based on value, safety features, convenience and other family friendly attributes. Parents magazine and leading car shopping and information network Edmunds have partnered for over 10 years to recognize the top vehicle choices for families looking to purchase a new car. Like years prior, 2018 winners were awarded after a stringent, six-month long selection process. “The fun design of the Kia Soul gives families more interior space, so car seats are easy to install,” said Liz Vaccariello, editor-in-chief of Parents magazine. Kia’s iconic urban passenger vehicle offers a fun, funky and functional approach to everyday driving. The 2018 model focuses on expanding the availability of UVO across the model range, adding the innovative infotainment system to the Base Convenience Package as well as to Soul Plus as standard equipment. The Soul Plus Primo Package now adds Smart Cruise Control and Autonomous Emergency Braking.